UPDATED IMMUNIZATION REQUIREMENTS FOR CHILDREN ATTENDING AND STAFF WORKING IN CHILDCARE FACILITIES. The Department of Health and Human Services updated the immunization requirements for children and attending a licensed child care facility and its staff. The update adds two vaccines required for children and slightly changes what is needed for staff. The new requirements will go into effect June 1, 2018 so families and childcare facilities can catch up. Children will need age appropriate doses of Hepatitis B (Hep B) and pneumococcal conjugate vaccine (PCV), and one dose of varicella vaccine by 16 months rather than by 19 months of age. Staff requirements add at least one dose of tetanus, diphtheria, and pertussis (Tdap) vaccine. Those born in 1957 or later need one dose of measles, mumps and rubella (MMR) vaccine. 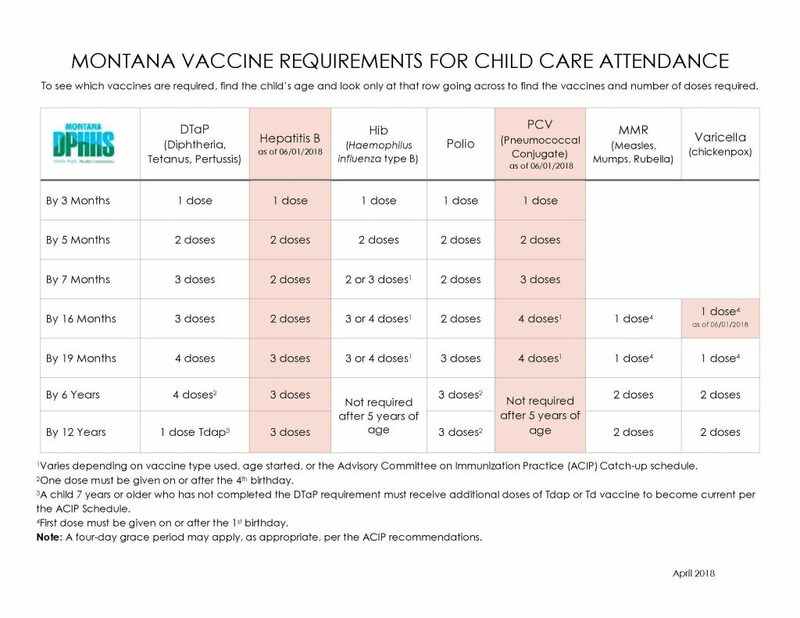 There are strict regulations in place that require infants and children to have up-to-date vaccinations before they can enroll in childcare facilities and schools (public & private). Daycare and school vaccinations can be handled by the experienced team of nurses at the Gallatin City-County Health Department. We have an income-based sliding fee scale, and we can bill insurance for those who have it. Please call for pricing questions, 406-582-3100.